Watch your step, Philae! 67P, the comet we landed a space probe on last fall, is apparently riddled with sinkholes. And as the massive ball of ice and dust hurls itself toward the sun, its surface is continuing to evolve. That, at least, is the latest fascinating comet discovery to make its way to Earth from the European Space Agency’s Rosetta spacecraft, which has been orbiting Comet 67P since last August. Based on a new imaging analysis, scientists have concluded that a series of circular pockmarks on the comet’s surface are actually massive sinkholes, ranging from tens to hundreds of meters in diameter. And some of them are growing. Almost as soon as Rosetta arrived at the comet last summer, astronomers noted large circular pits dotting the icy body’s surface. Since then, the spacecraft’s orbit has shrunk tenfold, from a distance of 60 miles to six. This has allowed scientists to take a series of high-resolution surface images, using Rosetta’s Optical, Spectroscopic and Infrared Remote Imaging System (OSIRIS) narrow angle camera. The camera uses CCD detectors similar to those in digital cameras and smart phones, but it employs mirrors rather than lenses in order to cover a much wider spectral range than what’s visible to the human eye. Digital images sent back to Earth between July and December 2014 revealed a wealth of new information about the comet, including ripples and dunes, over a hundred regions of exposed water ice, and now, 18 sinkholes. Sinkholes as deep as they are wide have never been spotted on a comet before, but we can make some educated guesses about their formation based on their terrestrial counterparts. On Earth, sinkholes form when subsurface erosion carves out a hollow cavern, eventually causing the overlying material to collapse in on itself. Similarly on 67P, the researchers propose that a heat source deep in the comet’s interior could be vaporizing subsurface ice, creating pockets that eventually collapse under their own weight and as the sun’s energy thins the overlying surface. Once a pit is formed, ice in the comet’s interior is exposed to direct sunlight and begins to sublimate even faster. 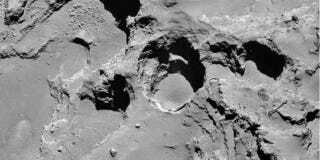 Indeed, Rosetta astronomers have observed gas jets streaming out of some of the deeper holes, supporting the notion that the comet’s architecture is actively evolving. Plenty of questions remain, including the exact nature of the comet core’s heat source, and whether 67P will become more worm-eaten as it treads closer to the sun (the comet reaches perihelion, or its closest point to the sun, on August 13th). But it’s quickly becoming clear that our perception of comets—as massive hunks of debris that fly through space until they disintegrate or smack into something—is a bit simplistic. Much like planets and moons, there’s more to these cosmic projectiles than meets the eye.